Bushcraft clothing, clothes for bushcraft, clothing for the woods, call it what you will, I’ve been asked about it a lot. I guess it’s because I spend a lot of time in the woods and have done for many years. I do shy away from talking about kit unnecessarily because I think there is an overemphasis on accumulating outdoor kit and an underemphasis on accumulating outdoor skills and experience. That said, we all need some outdoor clothing and equipment, more so as we move away from the equator. In particular, our clothing forms the first line of defence against hypothermia. In the woodlands of the northern temperate zone and into the boreal forest, where conditions can be cold and wet, we need clothing which is both protective as well as tough. The question of what I choose to use has come up several times in my #AskPaulKirtley shows as well as in other questions which have been submitted to me. I’ve been repeatedly asked to talk about what I use, what I like and why. I’ve resisted doing this for a some time as I don’t want people to feel pressured to use what I use. In the video below, I talk about three sets of multiple thermal layers combined with a shell layer which I find make particularly complimentary combinations. I should point out these are favourite combinations of mine. While I would, of course, recommend all of the garments in the video, this is not me saying you have to have any of these specific items before you go to the woods. This is not least because some of the garments I use carry a significant price tag compared to some people’s budgets. You should remember I work outdoors professionally. I’ve calculated that most professional people who have a number of good quality suits for their office job have spent more on those suits, along with shirts, ties and shoes have spent more than I have on my outdoor clothing. My clothing also needs to last. I spend a good amount of the year outdoors, through the seasons, teaching bushcraft skills, guiding trips and having my own outdoor adventures. I’m responsible for others when I teach and guide. I shouldn’t be spending time sorting myself out because I’m cold and wet, when I should be looking after my clients, running a course or a trip. I need to rely on my clothing. People have asked, though, and I’m answering. These are clothing combinations I use year-round in northern temperate forests as well as spring, summer and autumn use in the boreal forest. The various combinations of clothing in this video have served me well in the UK, Scandinavia and in North America. Much of this is in woodland and it’s tough on clothing. The shell layers are all resilient and tough, well suited to the higher levels of abrasion encountered in woodland settings. Just in case there is any doubt, I’m not being paid to talk about any of the garments or brands in the video. All of the items were paid for by me personally. It’s not just about specific brands or specific garments. There are some general principles at work here. 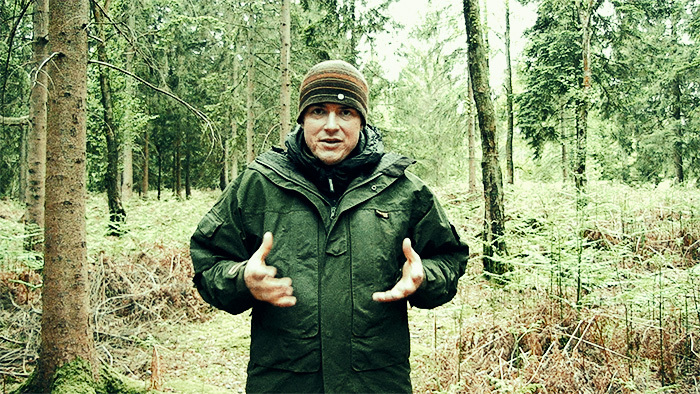 I refer to some of these in the video, particularly with respect to base layers and hats. In the text below the video, I continue the discussion, drawing out some general principles which you can apply to find items of clothing which fit your budget and specific needs. You can also watch Favourite Thermal Layer & Shell Combinations For The Woods on my YouTube channel. I mention it in the video but it’s worth re-iterating here – the overall value and performance I get from these clothing combinations is greater than the sum of the individual parts. While I look at particular models from particular manufacturers in the video (because these are what I own), I feel it’s worth drawing out some general recommendations which you can apply using any number of different manufacturers and models. If you need to be donning warm upper body layers, then think first about what you have next to your skin. Invest in a good merino wool base layer. They make a huge difference to your warmth and comfort level. The performance they add to your overall clothing system far outstrips any additional weight or bulk. The second basic which you need is a warm beanie hat. Again the added comfort and warmth from such a small item makes this a no brainer. A woolen head-over or scarf is also worth carrying in the colder months of the year. A thin fleece (Polartec 100) pullover with zip neck, to wear over your base layer. This type of fleece pullover is both ubiquitous and inexpensive. I like simple models that can be tucked into trousers for extra warmth. A medium to heavy fleece to wear over the thin pullover. In the video I show a medium weight fleece which also tucks in. If possible, I like this layer to have a hood as it adds a lot of extra protection from the elements for little extra weight. A sturdy breathable smock of Gore-Tex or similar. This should be large enough to fit over the thermal garments above. This type of smock is good for prolonged periods in heavy rain. The longer smocks keep your groin (and trouser pocket contents) dry without having to don waterproof trousers. This is my go-to style of jacket for teaching courses in the northern temperate zone and wilderness canoe trips. A thin fleece pullover as described above or thin fleece jacket over your base layer. A tough breathable shell jacket of Gore-Tex or similar. Triple-layered breathable membrane fabrics provide high performance and resilience. This style of jacket I use for hiking in heavy wooded areas and ski-touring. I look for good ventilation as well as good pockets for maps, compass, gloves. A synthetic pile-lined top with an integral windproof outer shell. There are a number of similar designs on the market, some designed to be worn close-fitting, some with a little more room. These garments tend to be very protective, even worn on their own. In the mountains, this is often all you need. The synthetic shell outer of this type of garment, however, is prone to damage from sparks in particular, but also thorns and the generally higher abrasion levels of life in the woods. In the woods, then, I recommend combining them with a tough smock over the top (see below). A Ventile smock over the top of the above type of garment forms a very tough, protective and breathable combination for the woods. Any of the three clothing combinations discussed above should last a long time if the items are selected carefully. None of the clothing I showed in the video is new. In fact much of it I’ve had for many years. For example, the Norrona jacket is at least 10 years old. The Buffalo Special 6 shirt is 15 years old. The Swazi Tahr is 7 or 8 years old. All of the garments have seen a lot of use. In particular the shell layers see months of use each year. For the amount of use they have had, all of the garments have provided incredible value. And that’s before I think about how many times they’ve protected me from hypothermia. Good vid. It really is about what works for you, and I think as a general guide you’ve outlined it nicely without getting hung up on brands. For me a merino high zip necked base layer, cotton shirt, wool jumper and waterproof jacket works. Also use a merino buff and wool hat. If I get too hot I can remove a layer or undo a few buttons, undo a zip, roll up sleeves and give some extra ventilation and that sees me through classic British changing weather in comfort. Hey Dominic, thanks for your comments. Sounds like you have your clothing sorted. Nice one. Hey Paul, long time no see! It’s always great to hear your take on outdoor activity and clothing is a special interest of mine. Thank you. I personally prefer canvas outer layers for the woods in Michigan simply because of its abrasion resistance….I’ve ripped a number of expensive coats in the brush. The farmers around here usually wear canvas when they’re working and I learned from them. I coat the canvas with water resistant aerosol spray for wet weather and use wool mid layers or quilted polyester jackets. Thermal underwear works best for me and it’s cheaper. Yeah, it’s been a while. I hope you’ve been keeping well? Good to hear from you anyway. Thanks for sharing what works in your neck of the woods. Excellent presentation as always Paul!! I have lately moved away from Goretex type materials personally due to condensation and sweat, however that is mostly due to my location being Australia. You are certainly spot on when talking about wearig them when not overly active as they are great in that situation. I have recently started moving towards layered merino and use a bush shirt over that which works well in our arid/temperate climate. I usually don’t experience huge volumes of rain where I live so a simple cotton canvas poncho works well. I especially love the fact that you point out in this video that people need to use what works for them whilst using the principal of layering. What you say makes complete sense in the context of your environment. This is an important point for anyone else reading this – fit, adjust and personalise your clothing choices to the environment your find yourself in. I totally agree that the layered way is the way forward. It is flexible and can be adjusted to the actual environment from day to day, hour to hour. Also agree that light Merino as base layer – either one or two supported by a fleece og Buffalo likewise and finalising with a shell jacket of some kind. This will have to be light wight, wind and water proof. This concept is easily adjustable and spare clothing can be contained in the rucksack steeling only little space. With regards to the hat I don’t doubt the efficiency I however personally like not to wear a one. If I have to I prefer a Merino beanie. Thanks for the always great advices. Thanks for the article. I usually think in terms of survival in widespread disaster situations over just bush survival dwelling. We live in an area that can go from 105F to -20 in one day and as low as -48F. So for me I go with Northern Outfitters gear and then always have a canvas anorak I made myself patterned after http://www.duluthpack.com/canvas-anorak.html. but with more options built in. For breathability I really like untreated 200-300g weight supplex as outershell for cold times. I carry Carhardt rain gear and Bivanorak I made myself patterned after http://us.hilleberg.com/EN/shelters/bivanorak/ (I love this thing for lightweight woods going…so versatile and I got the pattern from http://www.questoutfitters.com/ and modified it for more options. There is nothing like being soaked from rain or able to fall in the water with your gear on and then be perfectly safe as it dries off and you are still warm underneath. I make my own soles and moccasins for woods going and these are knee highs with an extra snake bite proof layering…learned from http://www.walkinglibertymocs.com/ I so love these soles and can refurb them easily myself….had these latest ones I made for 10 years. I work around the farm in Kamiks GreenBay in Winter, but only use Northern Outfitters extreme boots when in super cold. I use polypropylene or nothing next to my skin and then the insulation layers. I’ve been in -90F and high wind conditions so far to test these things and then have been outside without shelter other than my clothing in other conditions to test this out. I really like Ferrini Mountain Test Tents (Trango) and Hilleberg for mountain and high wind but But…what happens when you are separated from your gear?…so the point is well made that we need survival skills. I really appreciate you taking the time to write these comments. An excellent presentation Paul, thank you. I know you prefer to talk about skills and natural resources and your reasons for that are VERY well founded, but the insight you offer here is exceptional. Seeing how you exploit the relative advantages of different materials and combinations to suit the your destination, the season, as well as the level and nature of your activity is a real skill in itself. Your demonstration of the flexibility that can achieved by combining the right layers is a really valuable lesson. Brilliant ! Another informative video presentation, this time about clothing which actually works. Ventilation, together with layering, is clearly the big thing. Having hiked and wild camped in UK hills and on the coast, it can be frustrating to get clothing right. There’s no validity in cheap clothing in a survival situation, and High Street retailers seem more about fashion than fitness for purpose, judging by the many damning product reviews I have read. Personal fitness also counts – I know only too well that I sweat more when I am under par. I sometimes throw a poncho over myself (and backpack) in a sudden downpour – it’s not perfect, but at least it’s fully ventilated! Many thanks again, Paul, for reassuring “pointers”. You make very good points here. And I agree a poncho is a really good option as an instant cover-all. Really enjoyed watching this, very clear step by step instructions wel done. As a scout leader I will be getting the scouts to have a go at this. Hay Paul, Thanks for taking the time do this video. I watched it a few times I was trying to hear the name of the pants you had on? I got the name of the fabric G -1000 but who made them. I need to up grade my gear. I been using all my old US MIL. issue gore-tex witch works great but time to up date it. Hi Paul, watched this vid with interest. I’m a fairly warm bloke normally and am happy in a baselayer and fleece most of the time, but I’ve yet to find a waterproof that’s really breathable for me. I can’t afford the outerlayer waterproofs you mention above, so would you be able to suggest a slightly cheaper alternative? I had my eye on a Keela Munro, but figure I’ll just get sweaty in that as it’s the same ‘membrane’ principle outer layer that just doesn’t shift my sweat. I’ve had enough of getting soaked in my own sweat in my Ridgeline smock and am considering a paramo velez adventure smock as an alternative, but I’m put off by some old memories of them being far too hot and having a weird ‘cut’ to the garment (but that was in the covent garden store about 15 years ago!). Any pointers would be appreciated. I love my buffalo, but the special six was just too long for me! Mountain shirt all the way! Without any question it is helpfull, what you wrote, but every normal edjucatet person in the northern part of Europe uses t-shirt, shirt, woolen jumper or cardigan, jacket and a coat, if it is raining a raincoat! As you know, every person who is able to light a fire and has a militaryponcho or bivibag in the backpack will survive a night in traditional english clothing, so far he knows, what boy scouts teach! — In my opinion it is far more complicated to organise the lower part of the body, because longjohns and trousers have no full lenght zips like cardigan and jacket and rainjacket. And the big muscles of the legs make a high difference of temperature between use and no use, walking, running, standing, skiing, sitting! Shoes and boots are complicated to choose in most conditions, and to find the right socks is a horrably long and painfull way! Seriously: May bee, that british weather is more moderate, than what we have in Germany, because you are siiting on an Island, but for Germans and their Neighbours, trousers and boots are the complicatet points, far more, than shirts and jackets. You should please tell people about that in a second video! For beginners it isn’t a nature given instinkt to put the longjohns in the socks, the trousers in the boots, the raintrousers over the boots, and to change the right time of the year from high military boots to low ones an back! I will later write here some tips for clothing mixture in the area between Barcelona and Berlin, where you need most times of the year other clothing, than in your wiking areas. I was wondering; why do you choose to use a ventile smock in combination with a Buffalo special 6 over say the Swazi Tahr? Would it be because of the breathability? Or would it do just fine ?